I went to Le Grand Louvre exhibition in Kyoto, and appreciated the famous picture. 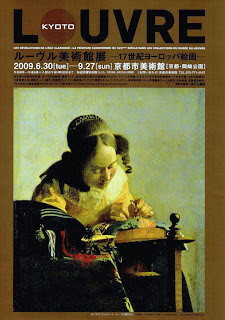 Well-known painter's work had been very exhibited to Velazquez, Vermeer, Georges, and Rembrandt, etc. I had seen these obtained the conviction. A famous picture and a work so were able to be distinguished based on my longtime experience. I was taken by parents at three-year-old time, and continued the painting appreciation for 20 years or more. Actually, I was not drawing the picture by one year ago at all. It was demanded from surrounding people to go to the university of the art though it painted as a hobby from 2 to 15 years old. Because it had become pressure, I stopped to draw the picuture at the age of 15. After that, I didn't draw it, but I started to draw again last spring. After that, I practiced picturing for one year. The period when I had not drawn the picture reached for as many as 12 years. It is a very long blank. However, I was able to regain the sense at once. Hereafter, I will devote myself.